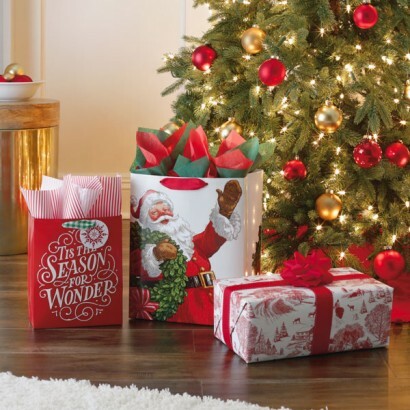 According to Hallmark research, 98 percent of consumers say they wrap gifts during the holiday season. When it comes to what motivates consumers as they wrap gifts, they say that they are hoping to impress others, just get it done, or express their sense of humor through their choice of holiday gift wrap. The majority of gift wrap is purchased by people ages 30 to 59. Moms buy over one-third of the gift wrap items. Hallmark is credited with founding the modern-day gift wrap industry in 1917. 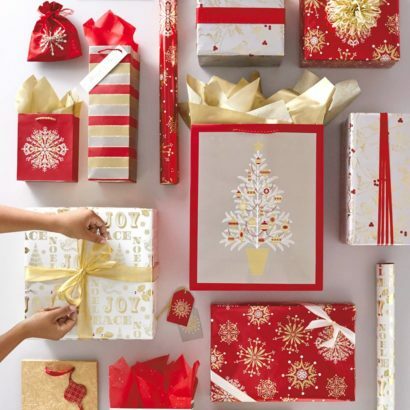 Hallmark is credited with founding the gift wrap industry when, during the Christmas season in 1917, stores ran out of the red, green, white and holly tissue sheets that people used to wrap gifts. Some decorative envelope lining papers from France were brought from Hallmark’s manufacturing plant and put on top of a showcase for 10 cents a sheet. They sold quickly. The next year, the sheets were offered three for 25 cents, and they again sold out. Soon gift wrap became the first product Hallmark made that was a departure from greeting cards.